Mace Head has been a site for aerosol measurements since 1958 when condensation nuclei and other aerosol particulates were measured at a small coastal lookout post adjacent to the present Mace Head station. These and other measurements were carried out sporadically during the 1960's and 1970's. 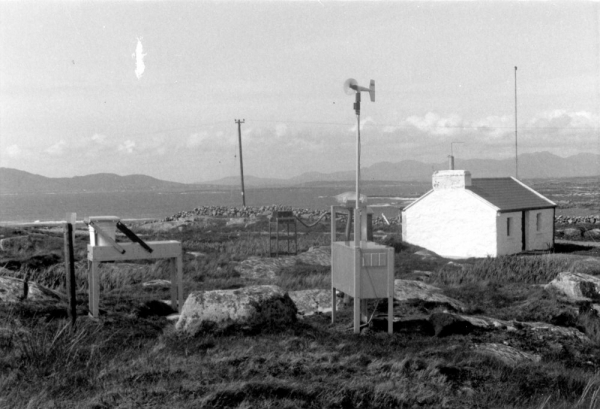 Increasing interest in environmental measurements led to the purchase of a larger (3 hectare) site at Mace Head in 1975 by the National University of Ireland, Galway for use as a background baseline research station. The ruins of a cottage on the site were refurbished for use as a laboratory in 1985 and a standard meteorological recording system was installed there. From the beginning it has housed the most sophisticated of sensitive gaseous and aerosol particulate instrumentation. In 1986, following a visit from the President of the International Commission of Atmospheric Chemistry and Global Pollution, Bob Duce, Mace Head was chosen as the site for major international projects to study background air levels. In 1987 the "Cottage" laboratory became one of 5 global sites for the Global Atmospheric Gases Experiment (GAGE) programme. This allowed for the continuation of work originally carried out by Dr. James Lovelock at Adrigole, near the south west coast of Ireland. In addition, Mace Head was chosen as one of four primary sites for the US Natural Science Foundation funded Atmosphere Ocean Chemistry Experiment (AEROCE) project which involved scientists from some 12 US universities and Governmental research institutions to study biogeochemical cycles in the North Atlantic Ocean. In 1989, a further laboratory was constructed close to the shoreline. This facility was constructed in co-operation with the Atmospheric/Ocean Chemistry Experiment (AEROCE) project and provided extra laboratory space for equipment being installed at the site. A 20m sampling tower was also erected as part of the AEROCE project. The development of the facilities at Mace Head was supported initially through funding by University College Galway, the Electricity Supply Board, the US National Science Foundation through the Universities of Rhode Island and Miami, and the Max Planck Institute for Atmospheric Chemistry in Mainz. The Irish Government gave further recognition to the importance of the site, when later in 1989 they provided funding for the construction of a second shoreline laboratory and an extension to the original cottage. The construction of these buildings, which was completed in 1990, more than doubled the cottage laboratory floor space available as the picture below shows. Further recognition of the uniqueness of the Mace Head site was afforded through its designation in 1994 by the World Meteorological Organisation (WMO) as one of the most important Global Atmosphere Watch (GAW) stations in the Northern hemisphere. One of the requirements of a GAW station is that its surroundings remain stable for at least 25 years. Mace Head is the only such GAW station in the station in the eastern Atlantic region and is the globally acknowledged clean background western European station, providing key baseline input for intercomparision with levels elsewhere in Europe. The Mace Head station is widely used used for numerous national and international projects.